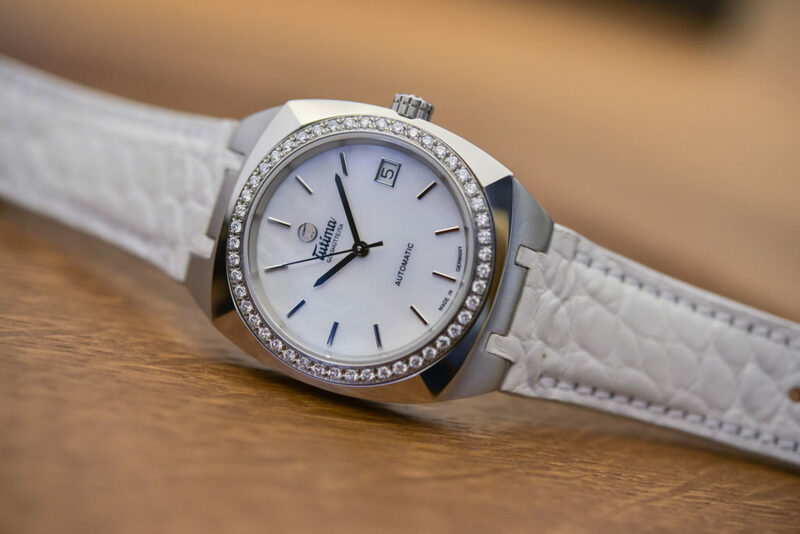 While I love a complicated women’s watch chocked with horological prowess and lots of function, not every timepiece has to be over the top. Sometimes a simply clean and classic look works wonders. 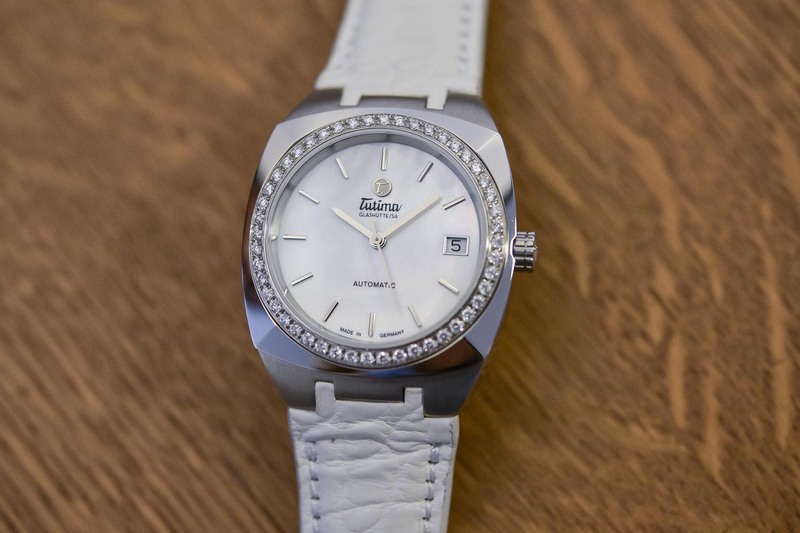 Such is the case with the German-Made Tutima Saxon One Automatic Lady watch, a brand-new offer from a brand more used to tools than feminity. I opted to borrow this timepiece for a review for several reasons – not the least of which is the brand itself. 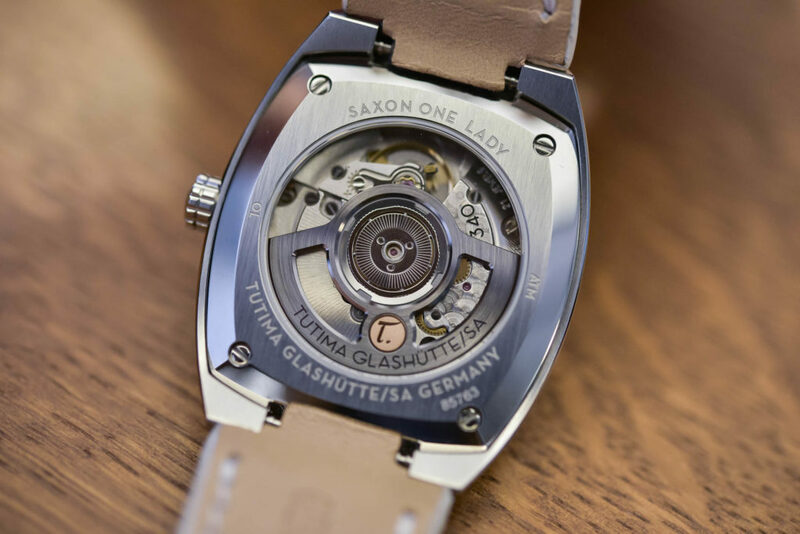 Predominantly a brand known for its pilot’s watches and rugged instrument timepieces for men, Tutima broke the mold a couple of years ago and unveiled an entire Saxon One Ladies collection that has great form, function and mechanics. 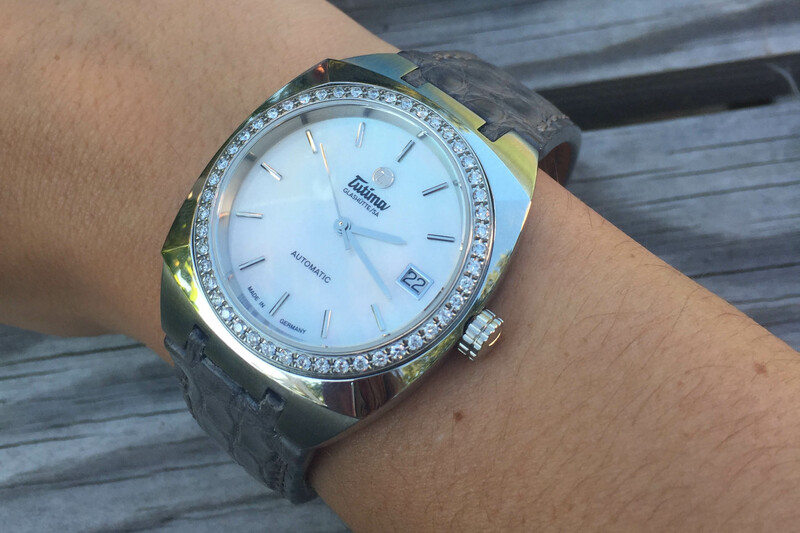 The Saxon One Automatic Lady watch that I borrowed is a 36mm stainless steel watch whose shape just keeps pulling my eyes to it. 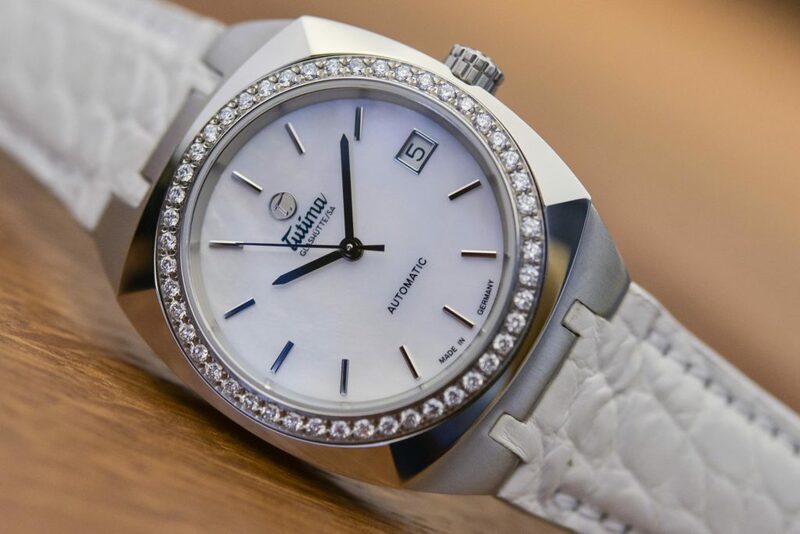 The watch has a cushion shaped case with an inner circular bezel and a round dial – for a great play on curved geometrics (just what women love). Even better is the fact that the lugs are ergonomically curved so the watch hugs the wrist beautifully. While the cushion case is highly polished, the lugs are satin finished for a nice, barely noticeable contrast. Additionally, the lugs hold an interchangeable strap into place – another thing I love about the watch. Being able to change the strap gives a woman so many choices. For the steel version I borrowed, I interchanged between a grey alligator strap and a white strap. I loved the grey strap the best because it gave a real tonal look to the watch. 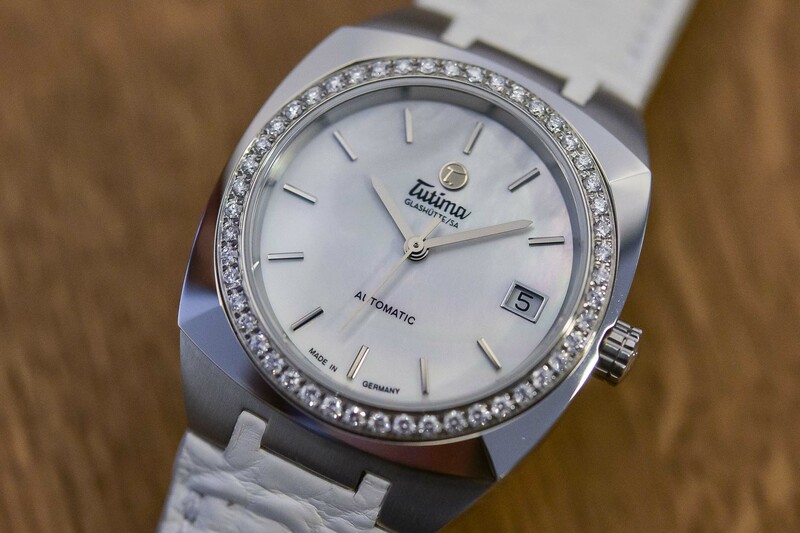 Tutima offers straps in a host of colours, and even also offers this watch on a stainless steel bracelet. I also like that the brand does not skimp at all – and equips the watch with a folding clasp on the straps. In addition to the steel version, Tutima also produces this timepiece in 18-karat rose gold. The dial of this watch is a shimmering mother of pearl that is one of the most iridescent dials I have seen in a long time. Any way I turned my wrist, that shimmer caught the light magnificently. 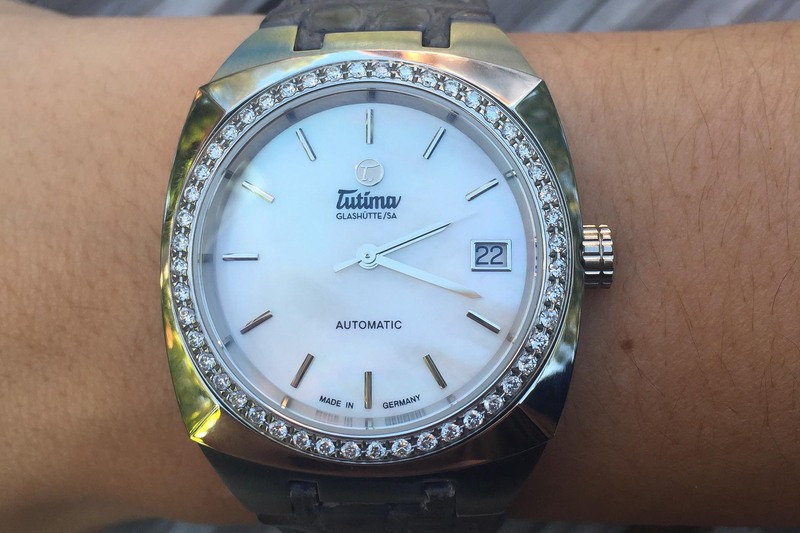 While Tutima offers the Saxon One Automatic Lady watch with or without a diamond bezel, I opted to wear the diamond version – mostly because I wondered if it would dress the watch up too much to want to wear it all day long. It didn’t. The diamonds were just the right amount of glam to feel special all day long without being showy. And it naturally transitioned to night with no problem at all. The Caliber Tutima 340 automatic movement (ETA-based) powers the watch and offers hours, minutes, and sweep seconds date at 3:00 (another thing I love because I just seem to never be able to remember the date) and 42 hours of power reserve. I would have liked a little more power reserve because I change watches every day, but many of the automatics have just 42 hours of reserve. The domed sapphire crystal is anti-reflective on both sides, so glare was never an issue. Additionally, I loved the see-through sapphire crystal for the case back because I could take off the watch and admire the finely finished movement (nicely decorated, with personalized dark metallic rotor). 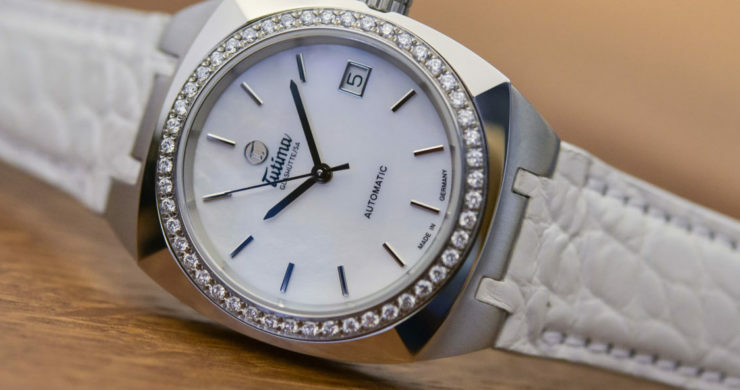 All in all, I think the Tutima watch is a great piece for women. It is alluring, attractive, and versatile, and houses a great mechanism. Best of all is the price: the stainless steel version with diamonds retails for $6,100 on the alligator strap and $6,500 on a bracelet. More details on tutima.com. This article has been written by Roberta Naas, founder of watch-magazine A Timely Perspective. Roberta is also the author of six books on watches.